Note: This is Greg’s first Seakettle post! Since he was completely responsible for every step except number 11, I figured it would be easier for him to explain the shelves than for me to transcribe the process. Thanks, Greg! We acquire a surprising assortment of stationery on a regular basis—postcards, wedding invitations, a Charley Harper calendar, a Gocco-printed envelope from the Renegade Craft Fair, etc. 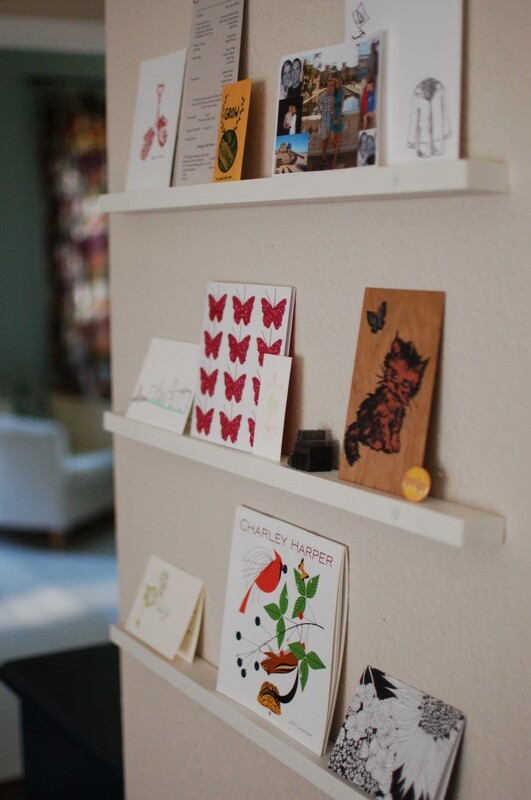 We wanted somewhere to display a rotating selection of these to provide both design inspiration and reminders of the people and places we love (all without cluttering our refrigerator or damaging the pieces with holes or clips). Jennifer found a perfect, easy solution on Young House Love. With an 8′ 1 x 2 from the hardware store (for 97¢! 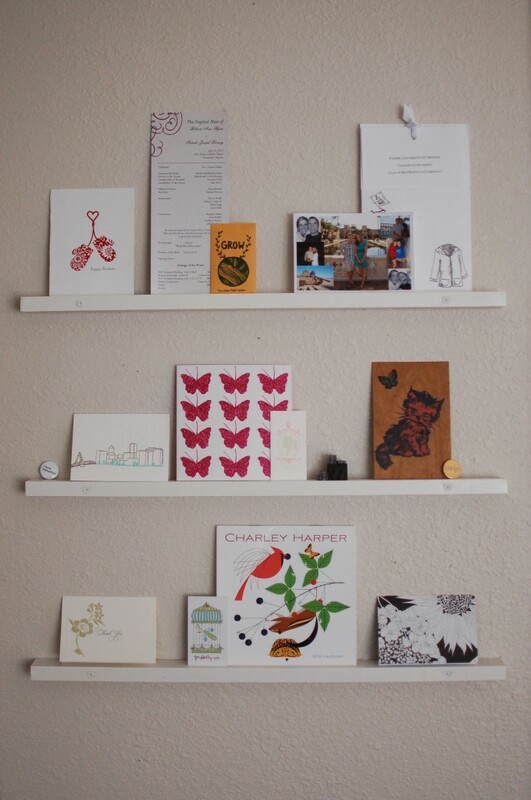 ), a handful of screws and drywall anchors and some white paint, we built and installed three simple, narrow shelves upon which to display our paper treasures. 1. 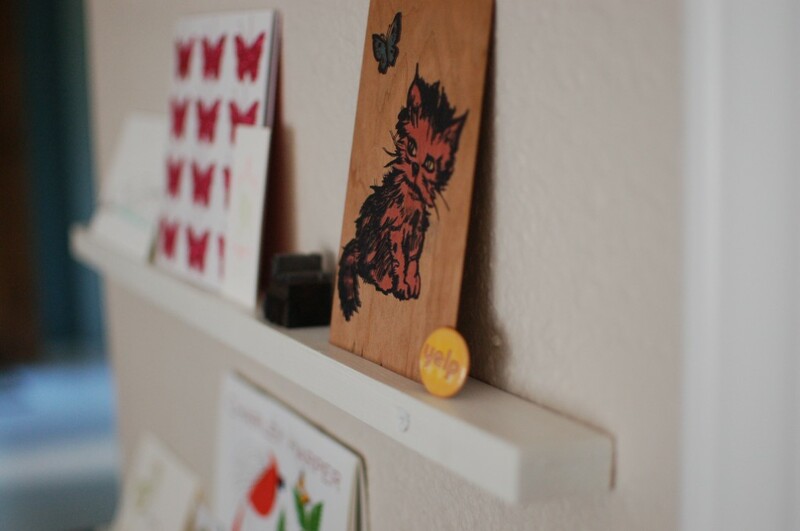 Stick pieces of painter’s tape to the wall to model shelves. Determine the ideal size and number for your space. 2. Cut pine into pieces of the desired number and length (three and 2′ in our case). 3. Paint the shelves white. 4. Drill holes through the 1″ side for the screws that will hold the shelves up (2″ from each end in our case). 5. Drive screws into the holes so they slightly protrude on the back side, e.g., 1/4″. 6. Hold shelf to the wall in its desired location, and mark the location of the holes on the wall by pressing the shelf against the wall. The protruding screw tips will create an indent in the drywall. 7. Insert drywall anchors where the drywall is indented. 8. Line up the screws with the anchors and attach the shelf by driving in the screws. 9. Repeat with each shelf, vertically aligning them and spacing them the desired amount (8.5″ in our case). 10. Paint the screw heads white. i got to see this in person and it is very cute! great job greg!